A healthcare provider uses a stethoscope and a blood pressure cuff with a sphygmomanometer to measure blood pressure manually. The stethoscope is used to listen to the blood pressure sounds, which are called Korotkoff sounds. The stethoscope is used on bare skin so that a client’s clothing does not affect the sounds. The stethoscope does not make sounds louder; it simply blocks out extraneous noises so you can better hear the Korotkoff sounds. These sounds are heard through a stethoscope applied over the brachial artery when the blood pressure cuff is deflating. You will not hear anything when you first place the stethoscope over the brachial artery, because unobstructed blood flow is silent. The Korotkoff sounds appear after you inflate the cuff (which compresses the artery/blood flow) and then begin to deflate the cuff. The Korotkoff sounds are the result of the turbulent blood caused by the inflated cuff compressing the artery and oscillations of the arterial wall when the heart beats during cuff deflation. Use a high quality stethoscope with durable, thick tubing. Avoid stethoscopes with long tubing because this can distort sounds. Ensure quiet surroundings so that you can better hear the Korotkoff sounds. Make sure that the slope of the stethoscope earpieces point forward or toward your nose. Use a stethoscope that has both bell and diaphragm capacity. See Figure 5.4 for bell and diaphragm. Cleanse the stethoscope prior to use including the ear pieces and the bell and diaphragm. 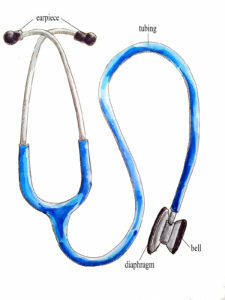 The bell of the stethoscope is suggested because it is used for low-pitched sounds like blood pressure. However, some healthcare providers use the diaphragm for several reasons: that is how they learned to take blood pressure; they believe this helps them hear the Korotkoff sounds better; and the diaphragm covers a larger surface area than the bell. Hold the bell lightly against the skin with a complete seal or hold the diaphragm firmly against the skin with a complete seal. You must ensure that the bell or diaphragm is open before using. See Film Clip 5.2 on how to open and close the bell and diaphragm. Healthcare providers determine the maximum inflation pressure before they take blood pressure. The maximum inflation pressure is the number on the sphygmomanometer that the cuff is inflated to when measuring blood pressure. If you do not determine the maximum pressure inflation, an auscultatory gap could go unrecognized, and as a result the blood pressure could be underestimated (lower than the actual value). An auscultatory gap is a silent interval when the Korotkoff sounds go absent and then reappear while you are deflating the cuff during blood pressure measurement. This gap is an abnormal finding and can occur due to arterial stiffness and arteriosclerotic disease. It is typically observed in people with a history of hypertension who have been treated with prolonged antihypertensive medication. To determine the maximum inflation pressure, start by palpating the brachial or radial pulse while inflating the cuff. Inflate the cuff 30 mm Hg past the point when you obliterate the pulse (ie., you no longer feel the pulse). If you still cannot feel the pulse, use that value to start auscultating – that value is the maximum inflation pressure number. When taking blood pressure, if an auscultatory gap is observed, document the first systolic sound and diastolic sound only. Report the presence of an auscultatory gap in narrative notes. Generally, auscultatory gaps do not interfere with automatic blood pressure measurements (Fech, et al., 2012). However, if a client’s blood pressure reading is suspiciously high or low, the healthcare provider takes blood pressure manually. For novices, it is a good idea to start with the two-step technique and then move onto the one-step technique as you develop your skills. Palpate the radial or brachial artery, inflate the blood pressure cuff until the pulse is obliterated, and then continue to inflate 20–30 mm Hg more (OER #1). Note this number – it is considered the maximum pressure inflation. Next, deflate the cuff quickly. Now, you can start to measure blood pressure. Place the bell of the cleansed stethoscope over the brachial artery (OER #1) using a light touch and complete seal. Inflate the cuff to the maximum pressure inflation number (OER #1). Open the valve slightly. Deflate the cuff slowly and evenly (OER #1) at about 2 mm Hg per second. See Film Clip 5.3 which focuses on the speed of the needle when deflating the blood pressure cuff. Palpate the radial or brachial artery, inflate the blood pressure cuff until the pulse is obliterated, and then continue to inflate 20 to 30 mm Hg more (OER #1). Place the bell of the cleansed stethoscope over the brachial artery (OER #1) using a light touch with a complete seal. Open the valve slightly. Deflate the cuff slowly and evenly (OER #1) at about 2 mm Hg per second. Note the points at which you hear the first Korotkoff sound (systolic blood pressure) (OER #1) and the last Korotkoff sound (diastolic blood pressure) before it goes silent. These sounds are called Korotkoff sounds and vary in quality from tapping, swooshing, muffled sounds, and silence. The first Korotkoff sound is the systolic pressure, and the diastolic pressure is the last Korokoff sound before the sounds go silent. Previous: How is Blood Pressure Measured? Next: What Should the Healthcare Provider Consider? Manual Blood Pressure Measurement by Ryerson University is licensed under a Creative Commons Attribution 4.0 International License, except where otherwise noted.